A garage that’s cluttered with storage boxes, children’s or pets’ toys, sawdust and power tools is not a space you’ll be happy or productive in. Chances are, most of these items wind up on the floor, where you can trip over them, a safety issue that further downgrades the garage from a well-purposed space to a dumping ground. Fight this tendency by clearing all items off the floor. Need space to store those boxes? Installing or placing movable cabinets in your space can help get stored items off the floor, while racks and hanging hooks can further help store garments and tools. Stackable containers that utilize drawer space can further help with organizing smaller items that need a home. In order to know what to store and where, consider how often you require a particular item. While holiday decorations can be stored in the back of a wall cabinet for annual use, your tool box should be within easy reach for day-to-day repairs. Particularly if you use your garage as a work space, having a grid-mounted panel can help you organize everything from protective goggles to baskets of spare parts. The main sections can be affixed to the wall, where you can attach hooks, shelving, and other accessories to keep your items neat and available. This one’s easy: keep items used for a similar purpose, like gardening or sports equipment, in the same area, so you can access everything you need for a task, when you need it. 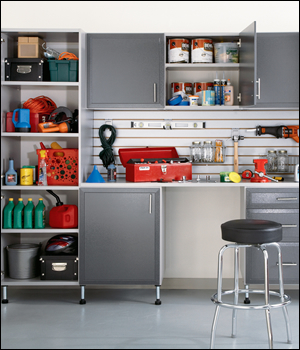 Permanent table or work benches are useful if you consider your garage a daily work space. However, if you only occasionally need a table or counter top, why not use a folding table instead? You can attach this table to the wall by fastening hinges to the wall studs, allowing the table to fold up or down. To hold the table in place on the wall, use a chain-and-hook method. Keeping your garage organized is an essential step to keeping the rest of your home neat and well-purposed, cutting down on the frustration that disorganization brings. If your garage needs more than just organizing and could use some work on the door itself, be sure to contact Ponderosa, for unbeatable service that keeps your home running smoothly!